Tsunamura Date, who was the fourth feudal lord of Sendai and famous as a wise ruler, commissioned an experienced weaver (in about A.D. 1680) to weave an exquisite and durable silk material which would be suitable for hakama (Japanese traditional pleated skirt for men), coats, and Noh (Japanese traditional drama) costumes. 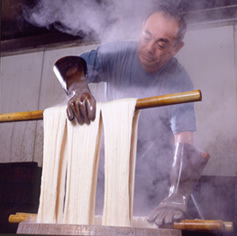 The new type of woven material came to be known as SENDAIHIRA. It is a rich soft material with a beautiful sheen which was used to make the elegant clothes of Lord Date and his samurai. 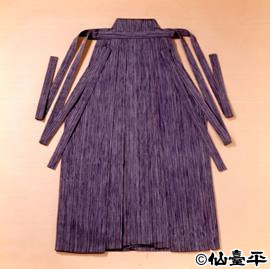 SENDAIHIRA became most highly prized as the best quality material for hakama. SENDAIHIRA was worn only by the highest ranking lords. It was much valued as gifts to the Imperial Family and the feudal government. At present, it is worn by Noh players because of its gorgeous, refined, and noble look. It has a softness and a stiffness at the same time which is suitable for dancers' movements, because no wrinkles appear on the loose hakama when the dancers sit, and it becomes smooth, straight and stiff when they stand up. It wears for long years and none of the colors will fade. It is said that there is no silk material more durable than SENDAIHIRA. 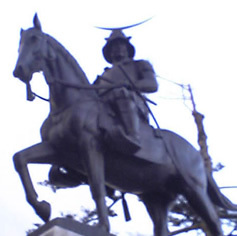 The predecessor Eisuke Koda, who was a superior SENDAIHIRA weaver, was given the Medal with Purple Ribbon in 1968,and the Order of the Rising Sun, gold Rays with Rosette by the government in 1970. And his ancient process was preserved by the Japanese Government as a national treasure. 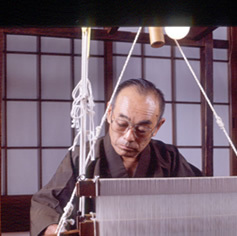 At present his son and disciple at the same time ,Yoshio Koda, a 14th generation weaver of SENDAIHIRA, was given the Kiwanis Japan Cultural Prize in 1993, and the Pola Traditional Culture Award from the Pola Foundation for the Promotion of Traditional Japanese Culture in 2001, and the Order of the Rising Sun, gold Rays with Rosette by the government in 2004. Yoshio Koda was also registered as a national treasure by the Ministry of Education, Culture, Sports, Science and Technology in 2002. 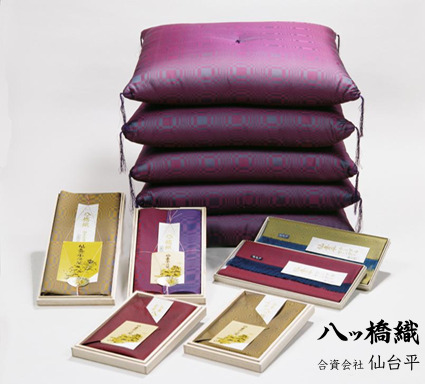 SENDAIHIRA's products other than hakama, such as neckties, wallets, centerpieces, cushions, and furoshiki (wrapping cloths), are highly regarded souvenirs of Sendai. The weaving process of SENDAIHIRA is quite different from the ordinary silk weaving. The weavers of this material use a special technique and are required so many years of experience. Raw silk thread is first soaked in ash water made from the ashes of burned rice straw. "Ohaguro" is used as a mordant dye. Ohaguro is a rusty colored liquid which is made from cooked rice mixed with iron and kept for twenty days. Dyes are used which are made from plants. 4. The warp is quite thick and approximately 10,000 narrow threads are used per one texture. 5. The woof organized some extremely narrow threads, is not twined. It is soaked in water many times and is not wound. Therefore, there is no shrinking nor spotting of the finished material. The woof is dipped in water, and is woven with strong strokes. YATSUHASHIORI, one of the most beautiful, traditional silks in Japan, was first woven in Sendai more than three hundred years ago. The zig-zag pattern of this twilled silk was copied from the design of the eight wooden bridge built over the pond in the beautiful garden of a feudal lord in Edo (at present in Tokyo). It is the own product of SENDAIHIRA ＆ Co., Ltd, and it is soft and yet durable. Therefore, it has always been a favorite of Japanese women. 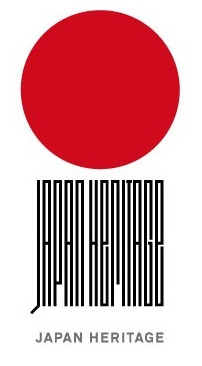 They use it to make their kimono, cushion covers, and so on. At present Yoshio Koda, whose method of weaving of SENDAIHIRA is registered as a national treasure by the Ministry of Education, Culture, Sports, Science and Technology in 2002, has a factory where this Yatsuhashi-ori is woven. SENDAIHIRA is the silk textile product that is woven only in SENDAIHIRA ＆ Co., Ltd(Sendai-shi, Miyagi-ken,Japan). The president of SENDAIHIRA ＆ Co., Ltd, Yoshio Koda, who keeps tradition and the skill of SENDAIHIRA, is authorized as a holder of an important intangible cultural property. "SENDAIHIRA" is a registered trademark of SENDAIHIRA ＆ Co., Ltd.